Rent the Depot for your community, group, or family activity! For information, visit our Rental and Events page. Contributing, Supporting, or Sustaining. Click here to download the Annual Membership Form. For more information, read the 2019 Membership Appeal Letter from Depot Foundation President Janet M. Smith. 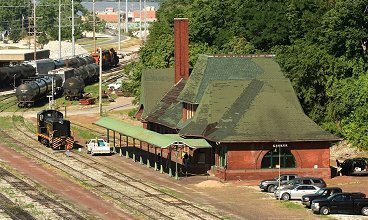 To hear interviews with people who remember the Depot when it was in railroad service, visit our History page. In 2011 the City of Keokuk, Iowa, acquired the Keokuk Union Depot from Pioneer Railcorp for the purpose of historic preservation and community use, and leased the associated real estate for 99 years. Erected in 1891, the building was designed by the Chicago architectural firm Burnham and Root. It is notable as one of John Root's last designs for public buildings in his distinctive Romanesque Revival style. Thereafter, with Root's death in 1891, architectural design in North America took a different turn. To volunteer to help with preservation activities, email the Depot Commission. To donate funds to the preservation effort, visit the Depot Foundation page. Or write to Keokuk Union Depot, P.O. Box 463, Keokuk, IA 52632. 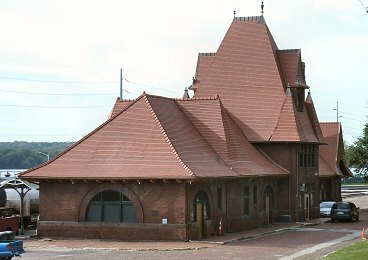 Architectural features of the Depot include Root's characteristic use of earth tones, arched windows and high-pitched roofline; the interior features an oak-paneled waiting room and octagonal ticket booth. 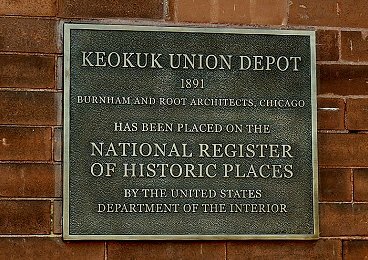 For the history of the Keokuk Union Depot visit our History page. 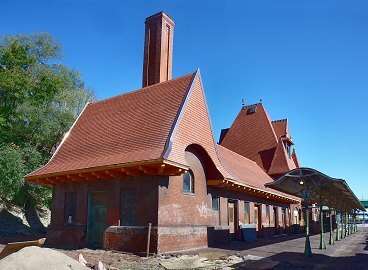 In 2011 an intern from the School of the Art Institute of Chicago developed an architectural study that resulted in the Depot's being listed in the National Register of Historic Places. (The Register is maintained by the National Park Service.) 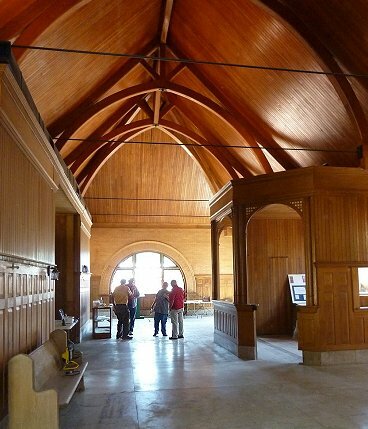 Restoric LLC, a Chicago firm specializing in the restoration of historic structures, completed a thorough architectural study in 2012 and produced a 180-page Historic Structure Report. 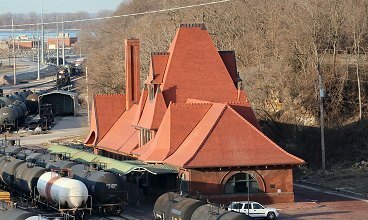 The plans drawn up from the Historic Structure Report form the basis for returning the Depot as closely as possible to its 1891 appearance, including replacing the shingled roof with clay tiles and rebuilding the central peaked tower, which was leveled off around 1950. The goal is to restore the building while adapting it to serve the community in a manner consistent with both historic preservation standards and contemporary requirements for public use. The final stages of roof tiling were completed in October 2018. Future projects contemplated for the Depot's restoration include renovation of the train shed (platform unbrella), restoration of the waiting room's tile floor, exterior brick repair work, landscaping, and conversion of the former baggage room to a kitchen. The Depot provides a venue for concerts and other local events, both public and private, as is evident from the schedule on the Rental and Events page. The Depot is located at Johnson and South Water Streets, between the Mississippi River and the limestone bluff along its west bank, and fronts on rail trackage used by BNSF Railway and the Keokuk Junction Railway (part of the Pioneer Railcorp system). The site is a block down-river from the US-136 highway bridge between Hamilton, Illinois and Keokuk. 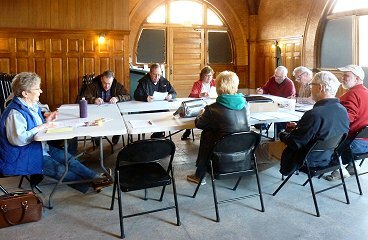 The Keokuk Union Depot Commission, appointed by the Mayor, administers the preservation project as part of Keokuk's larger Riverfront Development Master Plan. No municipal tax funds are to be used for Depot projects. A separate Keokuk Union Depot Foundation, a tax-exempt charitable organization, was established in 2012 to raise the necessary funds from grants and private sources. In 2014 the Keokuk Union Depot Foundation launched a Capital Campaign upon securing a one-third matching grant of $333,000 from the Jeffris Family Foundation toward the projected $1 million-plus cost of restoring the roof. Substantial grants for specific phases of the project from the Iowa Historical Resource Development Program (HDRP) were also instrumental in accelerating the pace of the project by enabling work on the building's eaves and reconstruction of the apex. Grants by local foundations and community groups have contributed to the effort, but a large segment of support has come from individuals who share the vision for preservation of this community resource. 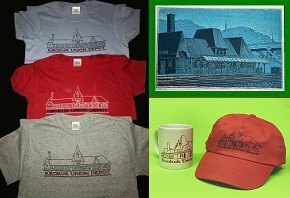 By the Depot's 125th anniversary in July 2016 the attainment of the funding goal was assured and work on restoring the central tower and tile roof commenced. Major roof restoration work was contracted and was complete by the end of 2018. Smaller projects have been undertaken by a corps of local volunteers. For highlights of the restoration effort, visit our Preservation Activity and Depot Foundation pages. the Keokuk Area Community Foundation, and the National Trust for Historic Preservation. Depot gift and souvenir items are available. Proceeds go toward the restoration effort. To purchase these items, please click on "Depot Gift Shoppe" above. This 1923 postcard depicts the Depot from the south (down-river) side, with the baggage carts that were in use when passenger trains served Keokuk.